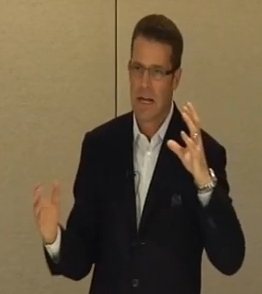 Frederick Darren Berg gestures during his sales pitch for his Ponzi scheme in 2009. Source: YouTube. It was the largest fraud scheme ever prosecuted in the Western District of Washington. Before his Meridian Group of funds collapsed into a pile of Ponzi rubble, Frederick Darren Berg ensconced himself in the lap of luxury. A $1.95 million condominium at Second and Union in Seattle. A $1.25 million house in La Quinta, Calif.
A $1.4 million condominium in San Francisco. A $5.475 million waterfront home on Mercer Island in Washington state. Two Lear jets for $5.5 million, including operational costs. Even after he was caught, the lies and profligate spending continued, prosecutors said. While his investors were left holding the bag, Berg used the cash to make lease payments on a Porsche Cayenne and Porsche 911 Turbo Cabriolet. In addition, prosecutors said, he paid a year’s rent up front on a Los Angeles apartment, bought an Audi S5 convertible, purchased insurance for “jet skis” and a yacht — and plunked down a retainer for a criminal defense attorney. Berg was charged criminally in November 2010 with wire fraud, money laundering and bankruptcy fraud. He pleaded guilty in August 2011. “Those who peddle false investments and prey on investors for their own personal financial benefit need to understand that law enforcement will not sit by and let it happen,” said Kenneth J. Hines, IRS special agent in charge of the Pacific Northwest. It was a case of “unadulterated greed,” a top FBI agent in Seattle said. “Mr. Berg took advantage of hopeful investors — many of them senior citizens who depended on their carefully built savings to afford assisted living, medical care, and higher educational opportunities for future generations,” said Steven M. Dean, assistant special agent in charge of the Seattle office. The day of reckoning for Berg, 49, came yesterday. Prior to sentencing Berg to 18 years in federal prison, U.S. District Judge Richard A. Jones told Berg “he had ‘reckless disregard for his victims . . . and had no moral compass,” prosecutors said, quoting the judge. Restitution is still being compiled. Prosecutors said it is expected to top $100 million, noting that Berg’s real-estate and financial swindle took in $245 million between 2001 and 2009 and consisted of schemes within schemes. Without investors’ knowledge, about $45 million was peeled off to acquire buses and to operate a transportation company known as MTR Western and subsidiaries. The long-running Berg swindle defrauded more than 800 investors, prosecutors said.